White House | Black Market is currently airing a new TV campaign that is somewhat reminiscent of Gap advertising from a few years ago ... showing off its latest fashions by toe tapping to the beat of an upbeat dance song. While the theme of the ad isn't necessarily new, the ad delivers its message in a fun, eye-catching way, using model Coco Roch as the star of the dancing fashion show. Known for their black and white clothing, the viewer may be somewhat surprised by the splash of red that sneaks into the middle of the spot. 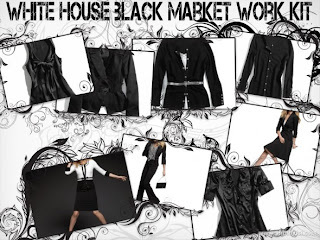 In the midst of the sea of sameness, it jumps off the screen, eloquently informing the viewer that White House | Black Market sells more than just white and black clothing. The main intent of this ad is to launch their new Spring business collection ... the WorkKit. The ad makes an interesting play on words, tying the collection back to the dancer who happens to be WorkingIt. Similar to the Gap dancing ads, the new White House | Black Market ad breaks through the clutter, simultaneously entertaining and educating the viewer. Comme nous le savons tous, la Robinet LED maintenant devenir de plus en plus populaire. LED robinets de cuisine et salle de bains robinets encore plus de Mitigeur douche. Mais il est aussi très important pour les gens de choisir un grand robinets de qualité LED. Si vous voulez en savoir plus d'informations de la maison et du design. http://www.robinetsale.com/ Vous pouvez me contacter. Best Selling http://www.cheaptap.co.uk/waterfall-taps-c-36.html For You with Great Quality and Fast Shipping, Choosing a suitable waterfall kitchen or bathroom tap for your house or work place.